The Life Of Faith: I'm due in 3 days!!! Can you believe that I'm due in just 3 days???? It seems like just yesterday I wrote this post ( The Surprise ) letting you all know my big news...and here we are 6 months later about to have this baby. Yep. I am about to have a baby! I learned SO much from you all last week on ways that I can prepare to have a natural labor. Thank you so much for all your great advice! What is your best advice for a new mom caring for a newborn? 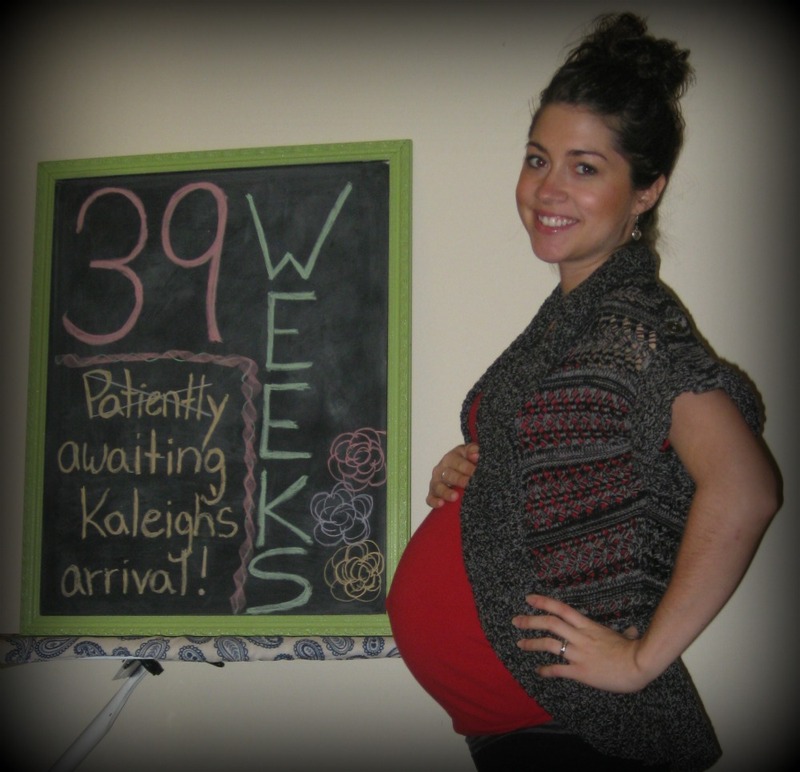 And here I am at 39 weeks and 4 days! How Far Along? 39 weeks and 4 days...and I haven't popped yet! Here's my attempt at a video of her moving in my belly. It's nothing like it can get at times, but better than nothing! Maternity Clothes: Nothing is really super comfy anymore. I'm sticking with my yoga pants during the day and a tank top or maternity shirt. I've been really hot so sweaters haven't been as fun to wear! Best Moment of my week: I took a nap yesterday and it felt amazing. Sad that's the highlight of my week haha. That's when you know you are super pregnant! Worst moment of my week: I can't really think of one. That's a good thing! Sleep: Still having a tough time sleeping. The past few nights I keep waking up to contractions! Miss Anything: My body haha! I feel so large and just uncomfortable! Aversions: eggs, peppers, onions, garlic. Gender: We are having a baby girl! I have the doctor check every time to make sure! 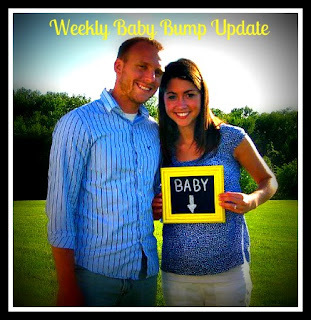 You can read about her gender reveal party here! Other Symptoms: Cramping, back pain, Sciatic nerve pain, swelling, heartburn, nausea, tiredness and anxiousness for our sweet pea to be born! Mood: Tired and very happy to have a healthy baby on the way! And here's another peek at the nursery. I'm working on getting a post together with more pictures, so stay tuned! And if you didn't get a chance to see our maternity photos, you can check them out by clicking here. Thanks for following along with my pregnancy updates and for your sweet comments! I love reading each and every one of them even if I don't get the chance to reply!! Cuddle cuddle cuddle with that baby! Lots of the things that you feel are important (especially with your first) are not actually that important... you WON'T regret the time just sitting and bonding. If family/friends come to help, instead of passing the baby around, have them help by doing the laundry or cooking a meal... while YOU hold your girl. Can't wait to see that beautiful baby! My best advice is "Let them." When someone offers to bring you a meal, hold baby while you take a nap, or by the grace of God do your laundry, let them. Blessings on the continued waiting game! Enjoy today. Oh and of course, sleep when the baby sleep; don't worry about a messy house; and don't feel pressure to do everything perfectly. There are no perfect mothers or perfect babies...just happy ones. Find what works for you and do it! The best advice I could possibly give you is to sleep as much as you can after you give birth, the baby will sleep and you should too! Catch as many z's as you can! Don't be afraid to give her a bath, after a couple times she will LOVE it, I promise. I know she is little but you'll do fine. Have fun and enjoy it as much as you can, it goes by so incredibly fast! Also, take many, many pictures! Document their every move, you're going to be thankful later, I promise! EEEEK!! How exciting!! 3 more days!! (Ive got 15!!) Stay positive, take deep breaths, and can't wait to see what your beautiful girl looks like!! Ah, I'm seriously so excited for you! I hope your next post is to say that your little girl is here! Praying that you have a safe labor and enjoy being a new mama! SoOOOOO exciting!!!! She'll be here before you know it! I somehow missed your natural labor update last week, I'll have to check it out cause I was super nervous about it but I got so much help and support I got through it :) Congrats! Congratulations. Advice - sleep when she sleeps. Let the chores weight and just snuggle the sweet little one. I'm a new follower so I don't know what all you've done to prepare for labor. If you want my unsolicited advice - just trust your body. You can try all the techniques in the world but when the time comes your body will just do it if you just surrender to it. I gave birth naturally to a 9 pound baby boy in August and I was blessed to be surrounded by a midwife and other people who just let me do what I needed to do. Good luck and I would love to guest post if you still need one! Oh, and don't be discouraged if she doesn't come in 3 days. My boy was a full week late with lots of false labor starts. I'd have hours of contractions and then nothing but then when the real thing came it happened fast. Best advice- Ask for help if you need it. Cuddle with that little baby all the time. Talk to her like she understands you. Read to her. Always carry a burp cloth. Take everything in stride! Just things I had to keep in mind when I had my little guy 6 months ago! My best advice is stay calm.... Your attitude effects the baby's and if you are anxious and nervous about everything then they are anxious and nervous. I tried to stay calm and relaxed with my little one and she has remained a very calm baby. My sister was the complete opposite and has a very wirey anxious baby. Also embrace and enjoy the newborn phase it was a favorite of mine and it goes so quickly..... Cuddle and hope your new baby as much as possible because before you know it they will be walking and not wanting all that cuddle time. Don't stress with the whole breastfeeding!! Don't get discourage...you will get soooooo much advice on "how to" you will end up frustrated. If anything, go directly to your lactation consultant. Also, sleep when the baby sleeps...trust me, you want to be healthy for baby, daddy, and especially you...you may start to experience the baby blues or the lack of baby bonding you thought you would have in the beginning...but it will come. Don't be afraid to express how you are feeling to a trusted friend and mama. You and your baby will develop your own routine, especially with breastfeeding, latching, etc. Above anything, pray! I also would encourage you to seek out a MOPS group in your local area. They are a great source of encouragement. I am not a momma yet (about 10 weeks behind you) so I don't have advice to offer yet. But I love the advice of the others! I also LOVE the video of your belly. As I was just typing out a post, my little girl was doing the exact same thing! Cannot wait to hear your little one is here!! !